San Diego Comic-Con announced just an hour ago that 4-day badge + hotel room packages are now open for sale. This is a special, limited time only offer. Badges do NOT include Preview Night, ALL Preview Night tickets for this year’s ComicCon sold out on-site last year. Book a minimum of 3 nights at one of the below hotels in the special offer program only. Stay must include the night of Thursday, July 21st. 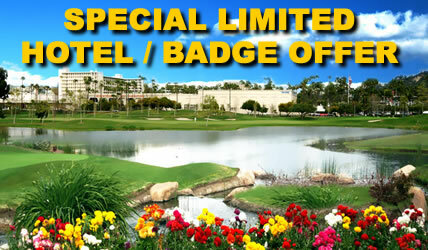 Additional nights are available at the Comic-Con convention rate which will increase the special offer price. Full prepayment of your hotel room is required at time of booking. Charges are non-refundable. You may purchase one badge per person staying in your room, up to a maximum of 4 badges per room while supplies last. All guest names must be on the reservation at time of original booking. Each badge is good for one 4-day badge for entry into Comic-Con starting on Thursday July 21, 2011 – Sunday July 24, 2011. Children 11 and under are free with paid adult membership (one child per paying adult). Adult 4-Day badges WITHOUT Preview Night are $137 per person, Junior (ages 12-17) 4-day badges WITHOUT Preview Night are $68. Travel Planners will send you directions telling your how to purchase your badges from Comic-Con within 2 business days of completing your room reservation. You must have access to the Internet and be able to purchase your badges on-line in order to qualify for this special offer. Room reservations and memberships are non-transferable. SDCC offered this special 4-day badge+hotel room package last year. It’s the same deal, no changes. There are seven hotels participating. Prices range from $149-$209. Full details can be found on Comic-Con’s Hotels Special page. can you please let me know how to get this?? i am travling from Venezuela. Hey Ana. I’m afraid you are out of luck. See my Comment above yours about ALL tickets, including the hotel+ticket deal, being sold out on June 30. So, No matter where you are coming from, as of June 30 you can’t get a hotel+ticket deal. And there are no legal ways left to get a ticket to SDCC ’11. So many people want them that Comic-Con tix sell out faster and faster each year.